Nearly 100 years ago, Austrian philosopher Rudolf Steiner worked with factory owner Emil Molt to create the first Waldorf School in Stuttgart, Germany with the goal of educating children to be clear-thinking, compassionate, and conscientious adults that could look at the world in complex ways rather than descend into world war. Steiner achieved this through creating a pedagogy that centered around reverence for, and deep observation of, how we as human beings naturally develop. Each of these stages requires a different approach in order to meet and engage the intellectual, physical, emotional, and social needs of the growing child. During Early Childhood (preschool, Nursery, and Kindergarten), learning occurs by facilitating self-initiated exploration through play. The Lower School engages the vivid imaginative nature of the child through a program where academic learning is intertwined with and supported by storytelling, the arts, music, movement, and practical activity. And the High School delivers a rigorous curriculum that fosters critical, independent thinking, artistic expression, and hands-on experience. In the early years, an emphasis on coordinated bodies, strong imaginations, healthy social interactions, and a love of work and play lays the foundation for academic excellence as students experience the beauty of language arts and literature, the culture of the world's civilizations through history and language, and the empirical qualities of the scientific and mathematical disciplines through a lively and engaging curriculum that introduces increasingly complex and sophisticated subject matter as the students grow and mature. When children learn in a way that honors their unfolding development (without trying to rush or speed up the process), they gain a quiet confidence, a mastery of skills, and a sustained interest in the world around them. In short, Waldorf students can experience the journey of childhood without having that spark of curiosity and creativity extinguished. 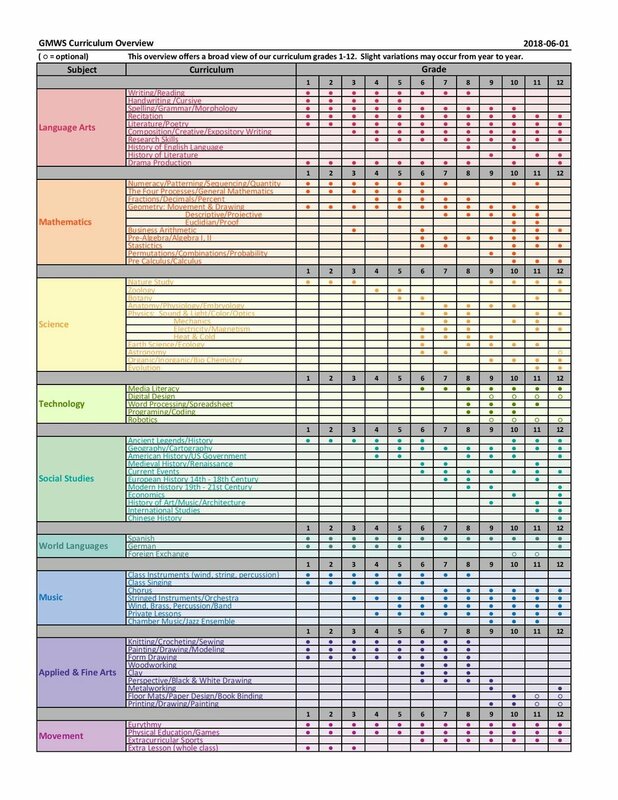 This overview offers a broad graphic view of our curriculum from Grades 1-12. Slight variations may occur from year to year. No matter the age of the child, a typical day for a Waldorf student follows a rhythm that breathes. From quietly and attentively listening to a story in the Nursery or Kindergarten to participating in a critical discussion of Dante’s Inferno in the High School, there are moments during the day where students will be applying deep focus and concentration, or breathing in. Those moments will balance to breathe out in activities like open-ended play, recess, games, and artistic classes like handwork, woodwork, metalwork, drawing, and painting. This balance optimizes learning, diminishes stress and fatigue, and allows the students to move through their day in a healthy way. Some of what used to be unique to Waldorf schools is now cutting-edge pedagogy in public and independent schools: block-style learning, teacher looping, multidisciplinary instruction (and its impact on neurological development), character education, a recognition of the importance of play and movement throughout the day (and throughout life), and teaching that engages different learning styles and acknowledges multiple intelligences. Green Meadow believes that time in school should be a process of discovery, not time spent learning to take a test. Since GMWS is an independent school, accredited by NYSAIS, AWSNA, and WECAN, we do not administer standardized tests. High School students do, however, take the SAT and/or ACT as part of the college admissions process. Our students in the Lower School are assessed through classroom observation and the relationship that develops between student and class teacher, including specialty-subject teachers, over the course of several years. As the student grows, traditional quizzes, tests, reports, and projects are introduced. Teachers observe and measure how a student progresses through the curriculum through insightful written reports that recognize an individual student’s strengths and challenges. No letter or number grades are given to mark a student’s progress in the Lower School and an open dialogue is established with parents through teacher conferences. As students move into the High School, letter and number grades are assigned, and our graduates enter selective, top-tier undergraduate and graduate programs at colleges and universities around the world. At different times throughout the year, we come together as a school community to mark the passage of the seasons and reflect on the idea that what happens in the world outside, also happens within each of us. In the autumn, we celebrate Michaelmas, a traditional harvest festival allegorized by the story of the archangel Michael slaying the dragon. Before the winter holidays, each class contributes an offering to our Holiday Assembly through the recitation of a poem, traditional folk dance, and a seasonal, Hanukkah, or Christmas song–all traditions are welcomed and honored. In the spring, we dance around the Maypole and celebrate the new life all around us. Though many of the common Waldorf festivals are rooted in European tradition, we at Green Meadow also celebrate festivals that reflect the cultural and religious traditions of our student body, both in individual classes (often incorporated into the world history curriculum) and within the school at large. Examples include the Indian festival of Diwali and Chinese New Year. Through these experiences, students develop an understanding and respect for the diverse cultures of the world and celebrate our common humanity, not our separateness in belief or practice. Without religious or denominational character, we recognize the universal spiritual nature of every human being while respecting all personal and religious beliefs.